Supergirl's original costume was sewn for her by her mother, Alura, when she and her family were still residents of Argo, the Kryponian city which survived the destruction of Krypton by being thrown into outer-space when the planet exploded. It is a one-piece, short, blue dress with a yellow belt, a red "S" emblem on the chest, and a red cape. The boots are a girl's version of Superman's and have low heels. 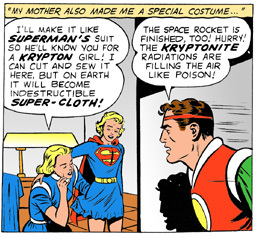 Since the entire costume is made out of Kryptonian fabric, it is completely indestructible while under Earth's yellow sun. 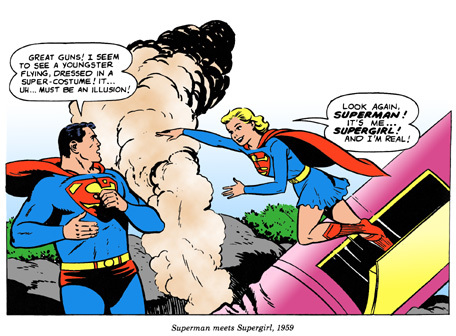 Supergirl used this costume continuously in her super-adventures commencing with her arrival on Earth in 1959. It served her faithfully in her years at Midvale Orphanage and afterwards, when she was adopted by the Danvers family. As Supergirl, she wore it through high-school and continued using it until 1970, part-way through her years at college.